This article is about the suburb of London. For other uses, see Ealing (disambiguation). Not to be confused with London Borough of Ealing. 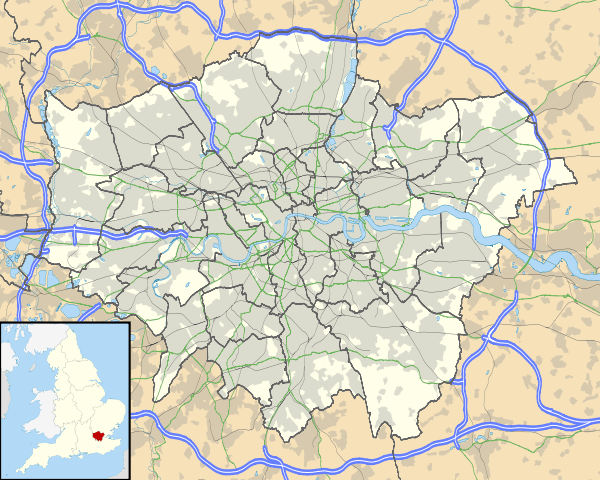 Ealing (/ˈiːlɪŋ/) is a major suburban district of west London, England and the administrative centre of the London Borough of Ealing. 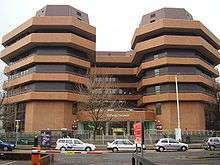 It is located 7.9 miles (12.7 km) west of Charing Cross and around 12 miles (19.3 km) from the City of London. It is one of the major metropolitan centres identified in the London Plan. 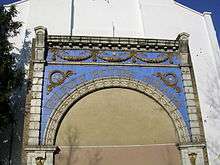 It was historically a rural village in the county of Middlesex and formed an ancient parish. Improvement in communications with London, culminating with the opening of the railway station in 1838, shifted the local economy to market garden supply and eventually to suburban development. With the exception of driving animals into London on foot, the transport of heavy goods tended be restricted to those times when the non-metalled roads were passable due to dry weather. However, with the passing of the Toll Road Act, this highway was gravelled and so the old Oxford Road became an increasingly busy and important thoroughfare running from east to west through the centre of the parish. This road was later to be known as the Uxbridge Road. The well-to-do of London began to see Ealing as a place to escape from the smoke and smells. In 1800 the architect John Soane bought Payton Place and renamed it Pitzhanger Manor, not to live but just for somewhere green and pleasant, where he could entertain his friends and guests. Soon after (1801) the Duke of Kent bought a house at Castlebar. Soon, more affluent Londoners followed but with the intention of taking up a permanent residence which was conveniently close to London. The only British prime minister to be assassinated, Spencer Perceval, made his home at Elm House. Up until that point, Ealing was mostly made up of open countryside and fields where, as in previous centuries, the main occupation was farming. The largest ethnic group in the 2011 census for the Ealing Broadway ward was White British, at 45%. The second largest was Other White, at 21%. Ealing is served by Ealing Broadway station on the Great Western Main Line and the London Underground in London fare zone 3. It is also served by four other tube stations at North Ealing, South Ealing, Hanger Lane and Ealing Common. The Piccadilly line operates at North Ealing, Ealing Common, South Ealing and Northfields; the Central line at Ealing Broadway and Hanger Lane; and the District line at Ealing Broadway and Ealing Common. The stations at Ealing Broadway and West Ealing are served by National Rail operators First Great Western and Heathrow Connect. Early in the 21st century Transport for London (TFL) planned to reintroduce an electric tram line along the Uxbridge Road (the West London Tram scheme), but this was abandoned in August 2007 in the face of fierce local opposition and a switch in priorities and funding to Crossrail. A total of 18 buses (including night buses) serve Ealing Broadway. The Who also met their drummer Keith Moon at the railway pub in Greenford. 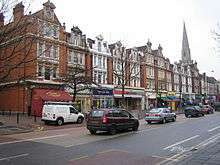 Ealing is home to Ealing Trailfinders Rugby Club & London Broncos Rugby League club. Due to the nearby football teams, Brentford Football Club and Queens Park Rangers, Ealing has previously not had its own football team, despite its size. However, in late 2008 a team by the name of 'Ealing Town Football Club' had been registered with The Football Association and will therefore start playing competitive matches in the 2008/2009 football season. ↑ Youngs, Frederic (1979). Guide to the Local Administrative Units of England. I: Southern England. London: Royal Historical Society. ISBN 0-901050-67-9. ↑ Oates, Jonathan (May 2008). "The days when this grand school truly was 'great'" (PDF). Around Ealing. UK: Ealing Council: 27. Retrieved 4 June 2008. ↑ Neaves, Cyrill (1971). A history of Greater Ealing. United Kingdom: S. R. Publishers. pp. 65, 66. ISBN 0-85409-679-5. 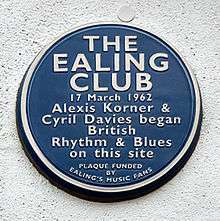 ↑ "Sexual Ealing: Was Rock Music Born in London W5?". The Huffington Post UK. ↑ Ox-Fanzine. "Reviews : ZATOPEKS / Damn Fool Music CD :: ox-fanzine.de". ↑ "Letra e video The Boy Done Good de Zatopeks". ↑ "Songtext: Zatopeks - Turn To Gold Blues". MusicPlayOn. ↑ Sweeting, Adam (2008-11-14). "Mitch Mitchell". The Guardian. United Kingdom. Retrieved 2016-08-22. ↑ "Ealing Southall & Middlesex Athletic Club". ↑ "UK Athletics Power of 10 Athlete Profiles – Kelly Holmes". Retrieved 14 July 2011. ↑ "Ealing, Southall & Middlesex Club Records". Retrieved 14 July 2011. ↑ "Ealing Cricket Club". Pitchero. ↑ "D3 Ealing Triathletes". D3 Triathlon. Retrieved 5 March 2014. ↑ "Ealing Music and Film Valentine Festival". The Ealing Music and Film Festival Trust. ↑ Michael Flynn. "Ealing Beer Festival 2014". 1 2 3 4 "Ealing Festivals". Ealing Council. ↑ Shown on the network map when she logs on in The Bells of Saint John, their home is immediately north of the intersection of S. Ealing Rd. and Pope's Ln. ↑ "Ealing and Brentford: Public services". ↑ McEwan, Kate (1983). Ealing Walkabout: Journeys into the history of a London borough. Cheshire, UK. : Nick Wheatly Associates. p. 45. ISBN 0-9508895-0-4. ↑ "Ealing and Brentford: Growth of Ealing". ↑ Booth, Robert (30 January 2013). "Polish becomes England's second language". Guardian. ↑ "Ealing's Local Web site". Oates, Jonathan (31 July 2006). Foul Deeds and Suspicious Deaths in Ealing (paperback). Barnsley, South Yorkshire UK: Wharncliffe Books. ISBN 1-84563-012-2. Retrieved 13 September 2006.